Are you searching for a low-cut, comfortable but pretty plum coloured nursing bra? If so we recommend the Bravado Confetti nursing bra. It features a lovely Swiss dot pattern, and will offer you great support. So why will you find this bra so comfortable? Well, it is super-soft and lightweight. We think you will also love the fact that it is totally seam-free. Do you get irritated by tags and washing instructions in your bras? Well, Bravado have removed these and have even printed the washing instructions on the inside of the bra itself! So what makes the Confetti bra so pretty? Well, as well as the dot pattern, it also has a lace trim as well as a delicate bow detail between the cups. It also will give you a low V-neck style. Breast-feeding advisors suggest that you should, if possible, avoid wearing underwires during your nursing months. So we think you will be delighted to know that this bra is wirefree. It also has cups that fully drop down. This means you get full skin-to-skin contact with your baby, which is also recommended. How about the sizing? Well, this is made really easy for you. There are just four sizes to pick from (Small, Medium, Large and Extra Large). The bra is made from a stretchy fabric which has a high level of Elastane. This allows the bra to mould to your shape and will give you great support. Your size may change during the day as your milk comes in, so the fact that this bra will stretch should mean that you will find it comfortable at all times. Not sure which size to pick? Please see the chart below to select your size. When you come to feed your baby, we think you will appreciate how easy it is to open the bra with just one hand thanks to the easy-to-open clips. The material of this bra is 75% Nylon, 16% Polyester, 9% Spandex (excluding the elastic). 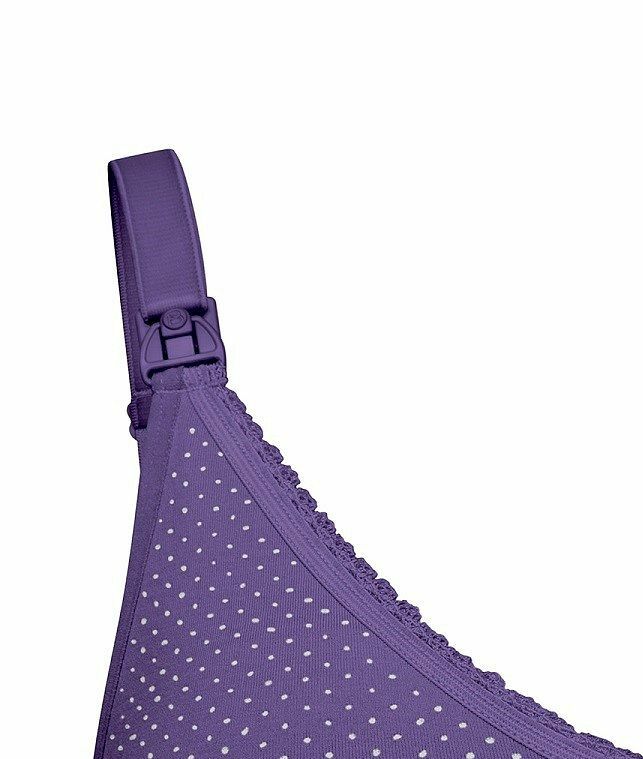 If you have not yet given birth, we think you will be pleased to know that this bra can be worth both before and after you give birth, meaning you get even better value for money. 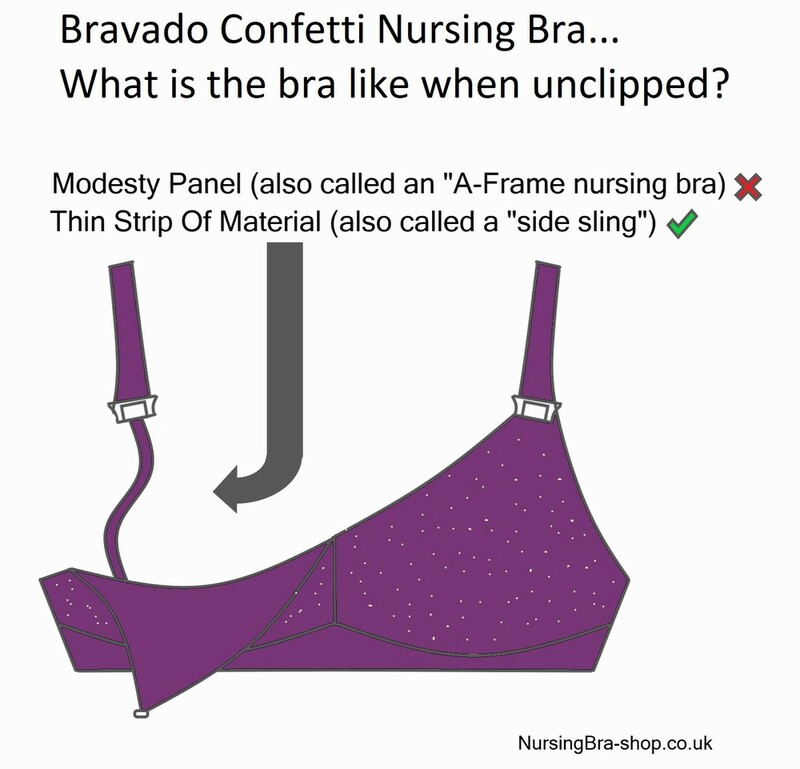 So why do we think you should choose the Bravado Plum Confetti breastfeeding bra? Well, it will offer you great support, is really comfortable and is also very pretty. It is also perfect if you would prefer a low-cut nursing bra.